This 1918 photograph shows the Streeterville extension and development east of Pine Street. 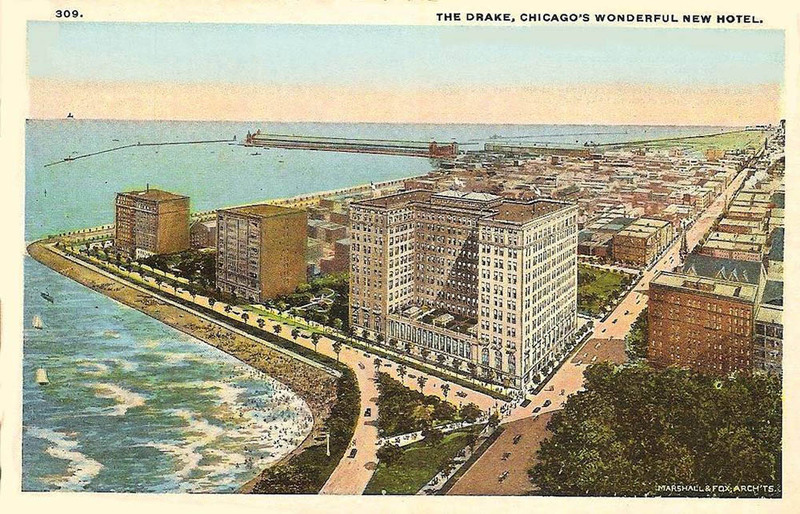 The new Drake Hotel stands top left, north of the Water Tower and Pumping Station where the street had not yet been widened. The new Chicago Avenue Armory and the rows of trees of the new Lake Shore Park lead out the right side of the picture. Courtesy of Chuckman's collection of Chicago postcards. While this idealized view of the Streeterville area omits the Water Tower and Pumping Station, it shows other recent elements in the development of the lakeshore. Navy Pier, completed in 1916, juts out at the top of the image; and Oak Street Beach, built by Lincoln Park workers in 1904, curves at the view's bottom. Presented by permission and courtesy of the Chicago Park District Special Collections. 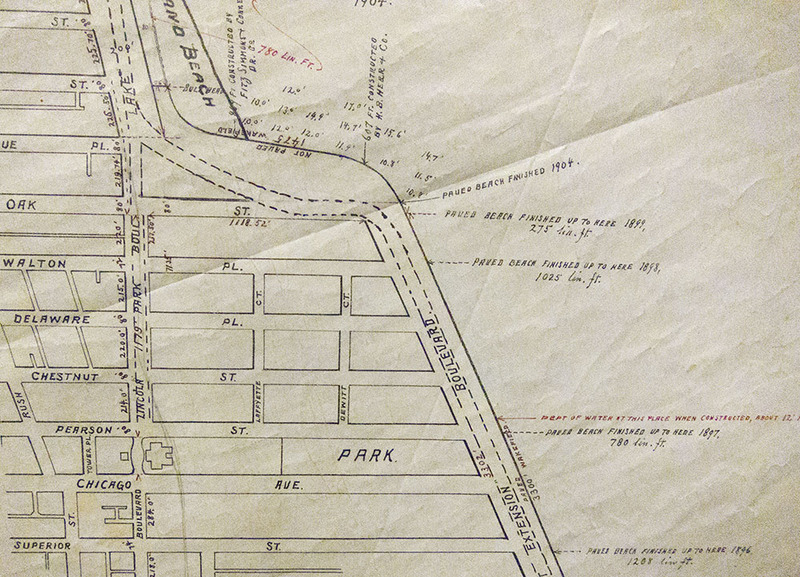 This hand-drawn map details the Lincoln Park Commissioners' work on Lake Shore Drive and Oak Street Beach. Notice that Pine Street is now called Lincoln Park Boulevard. Someone has pencilled in the meander line to the right of the pumping station footprint, representing the shoreline at the time the Water Works was established on that site. Starting out as industrial area along the lake's shoreline, wealthy landowners who had already established the neighborhood along Pine Street (known as McCormickville,) expanded their holdings after the 1871 Chicago Fire. Once a dumping grounds, the area has since become the home of Chicago's elite.